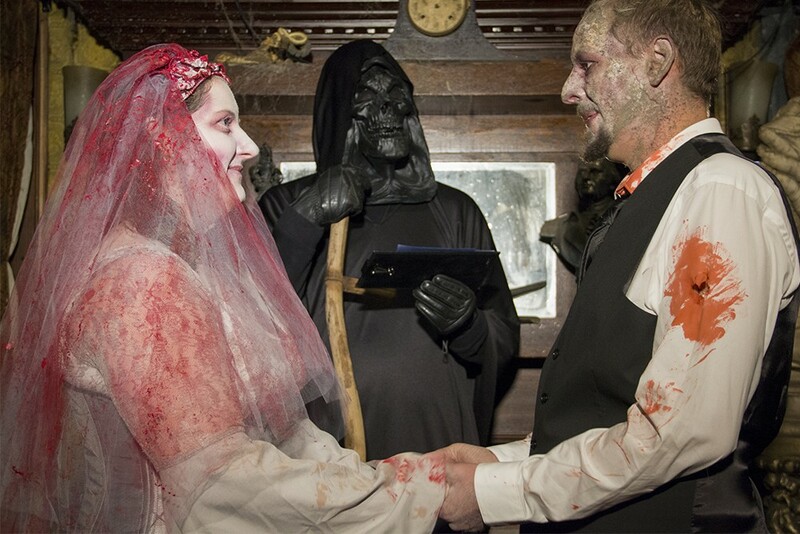 Stephanie Greenhalgh and Justin Ethridge, sharing the wedding of their nightmares. On the day of her wedding, Stefanie Greenhalgh considers her reflection in the makeup artist's mirror. The changes had started small: A corpse's pallor brushed on her cheeks, circles of bruised purple etched around her eyes. Then came the delicate red veins creeping up her jaw — and the gruesome stab wound dripping blood down her bodice. 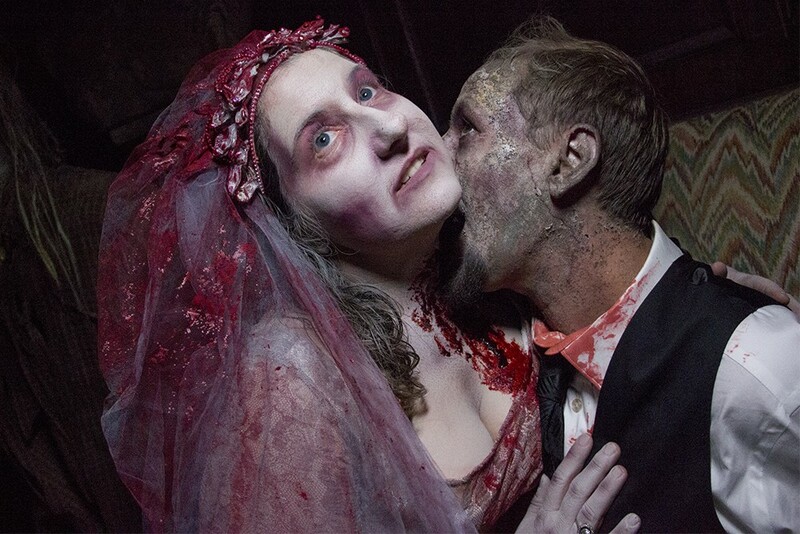 She was the perfect bride for a haunted house wedding. 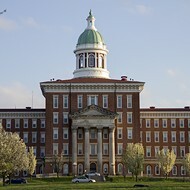 In St. Louis, no house is more haunted than the Darkness. 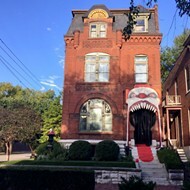 Inhabiting a two-story warehouse in Soulard, the Halloween attraction employs more than 80 actors in a production that's gone on seasonally for 25 years. It's where Greenhalgh and her fiance, Justin Ethridge, went on their first date, followed by several dates since. And today, it's where they're getting married. Naturally, they're doing it darkly. From a nearby chair, Ethridge watches his fiancee's transformation. Ethridge's face is a mottle of purple veins, his skin zombified to a sandy texture, as if he'd been left somewhere to rot. Not even layers of makeup can hide wedding day romance. "Other people would go out to eat and things like that, or go to a movie," he says later. "We go to a haunted house. It's just our personalities. We both enjoy the same dark sense of humor." Ethridge and Greenhalgh are both in their mid-thirties. Both live in Illinois about 100 miles outside St. Louis, and both work as a long-haul truckers. The job is not easy on the couple. They work for separate companies, and Greenhalgh estimates they see each other only three or four days a month. 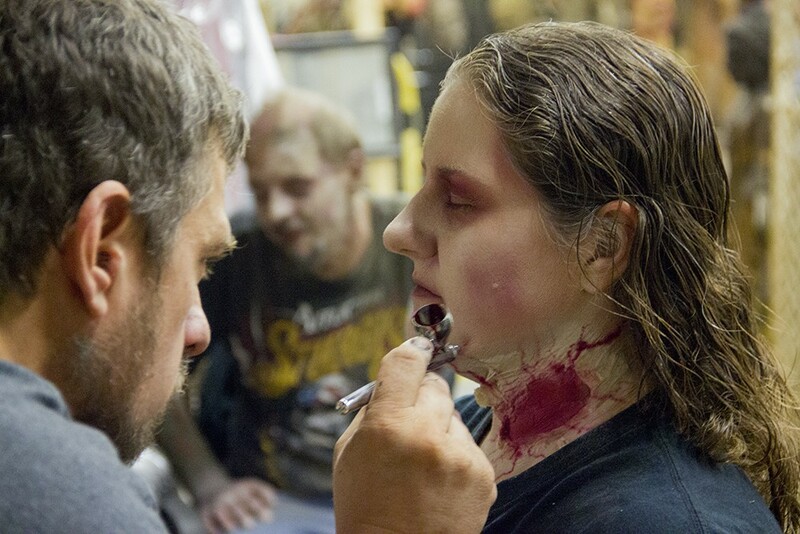 A makeup artist uses a paper towel and paint to create the texture of a neck wound. Greenhalgh grew up in a family that cared, really cared, about Halloween. They fashioned a homemade haunted house every year, and in her twenties she started making an annual pilgrimage to the Darkness. "The decor in there is so beautiful," she says. "I walk through there and get home decorating ideas." When it came time to plan the wedding, the idea of doing it at the Darkness struck Greenhalgh as a lark. She didn't expect owner Larry Kirchner to say yes. She would have been happy to simply to get married in the parking lot, with a traditional reception replaced by a trip through the house after the ceremony. The Darkness was totally on board. 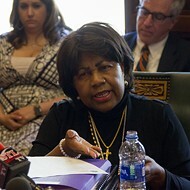 "They took it one step further," Greenhalgh says. "They said, 'Come inside and get married inside the haunt itself.'" 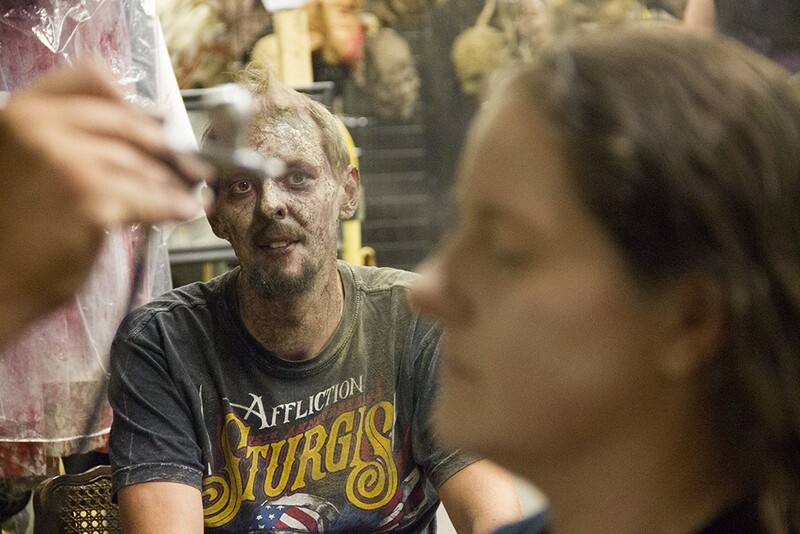 After the first round of makeup is done, one of the actors leads Greenhalgh and Ethridge through the labyrinth of back hallways that connect the attraction's main rooms. They pass by curtained doors leading to a decrepit Victorian study and a morgue with dismembered bodies left writhing and split open on examination tables. These passages are the blood vessels of the Darkness. Up a flight of stairs, the couple comes to the brain — an office complete with a kitchen, bathroom and lounge (also, a closet full of spare clown masks). In the bathroom, Greenhalgh changes into her blood-stained wedding dress, and a manager at the Darkness assists in tightening the corset. Greenhalgh has never worn one before. "I never even wear dresses," she says, laughing. "A wedding was the only way I was going to get into one." On a nearby table, two skull-shaped candles rest next to a palm-sized black coffin with the words "till death do us part" painted in white. Ethridge's nine-year-old son, Levi, will be the ring-bearer. On the pillow he carries lie two severed fingers made of plastic. The rings are in the tiny coffin. When the hour of marital horror arrives, about a dozen costumed guests are led through the haunt's unnaturally quiet hallways. When active, the Darkness' interior shrieks with the amplified screams of angry spirits. Now it's mostly giggles and small gasps of surprise; even without sound effects, it's easy to be startled by a mannequin hanging from the ceiling by a hook through its chest. The ceremony begins in a room modeled on a sort of hunting lodge (based on appearances, the hunt apparently went awful for everyone involved). The officiant signals for silence, his voice echoing behind a Grim Reaper mask. "Dearly departed," he begins, "we are gathered here today to mourn the undead, unholy union of Justin and Stefanie, two demented souls who have wandered the earth in despair." Death himself presided over the wedding. The couple wrote the words together. Leaning on his wooden scythe, Death remarks that the two "demented souls" had spent years searching for an equal, "a mind as twisted, a heart as black as their own." The reaper turns to Greenhalgh. "Stefanie, do you take Justin to be your husband? To hurt and to harm, in bad times and worse, in sickness and death, through torture and torment, for the rest of your unnatural lives?" 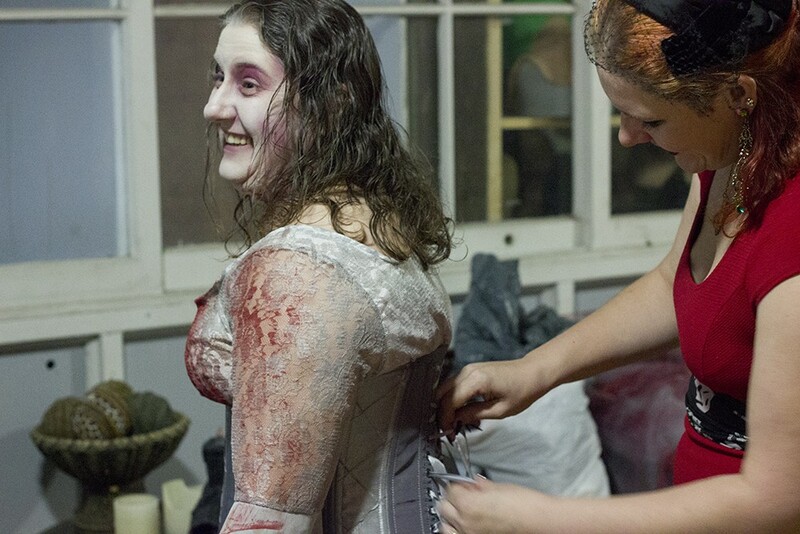 Despite the dour makeup, the bloody bride's eyes seem to glow. Then it is Ethridge's turn. "I do," he says. They kiss. The crowd howls like werewolves. Then, somewhere in the recesses of the Darkness, someone flips a switch. Through the air comes the sound of chains clanging, the angry whispers of ghosts. Then, inches behind Greenhalgh, a wild boar covered in intestines bursts through a dresser, its mouth opening and closing with awful anatomical accuracy, its tusks drenched in blood. Greenhalgh shrieks and laughs as the room comes to horrific life around her. 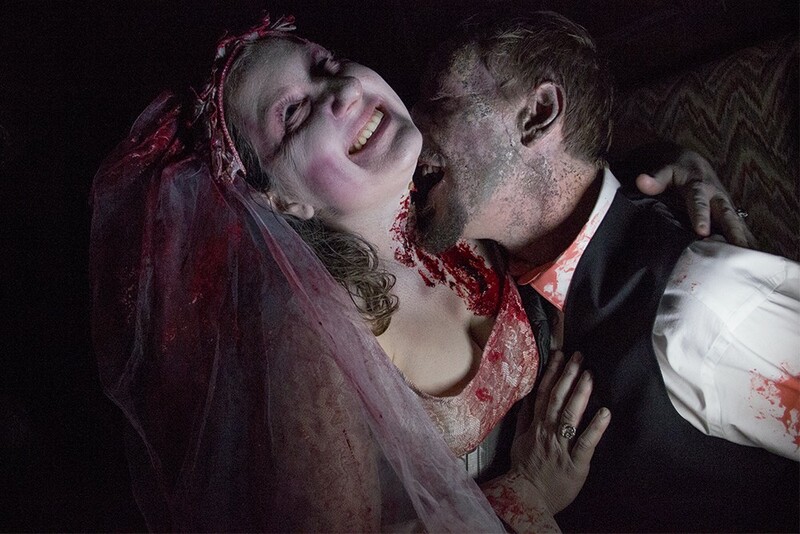 The wedding party poses for photos — in one shot, the bride and zombie husband stare menacingly at a baby crib. They reenact their engagement in a room piled with bodies. Ethridge pretends to rip his wife's neck out with his teeth. But they soon clear the area. Actors need to get into their places and ready themselves for a long day of scares, and there's pizza on the way for the wedding party. But afterwards, the newlyweds have one more date planned. It's close to Halloween, after all. They have their tradition. A date with the Darkness.